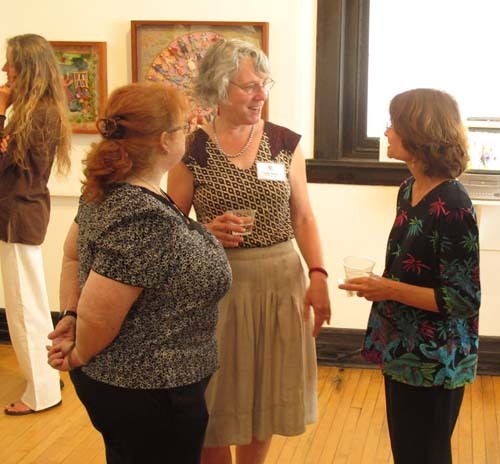 I’ve been so busy that I’m just now getting around to writing about our wonderful visit to Brattleboro, Vermont for the show opening on July 15th. 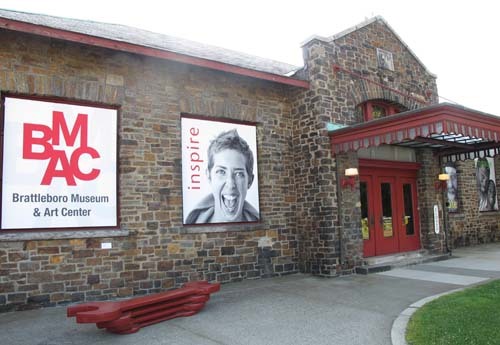 The Brattleboro Museum and Art Center is housed in the old train station right in the middle of town. 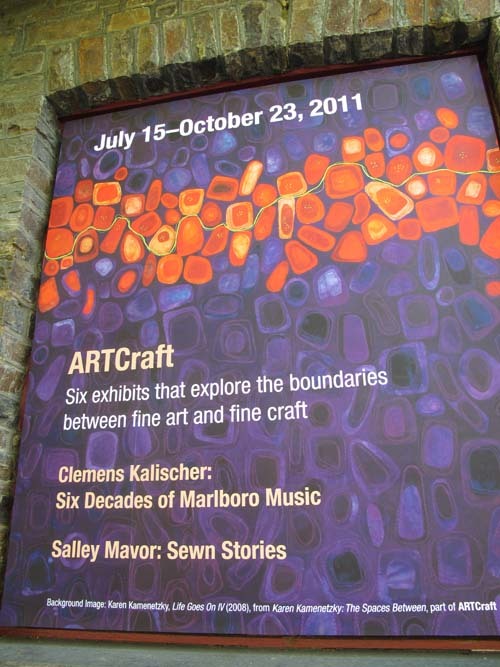 It is a beautiful facility and during this rotation, most of the galleries are showing exhibits of work that “explore the boundaries between fine art and fine craft”. 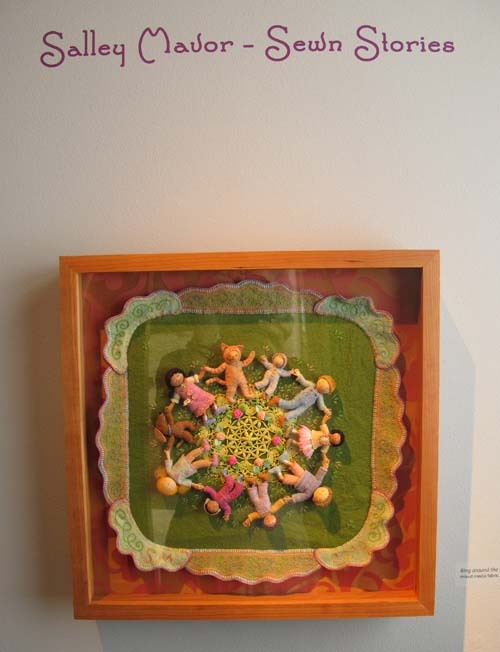 My show, Sewn Stories, will be on display for 2 rotations, so it will be up until February 5th, 2012. I will be returning on Sat., Oct. 15th to give a talk at 3:00 pm. 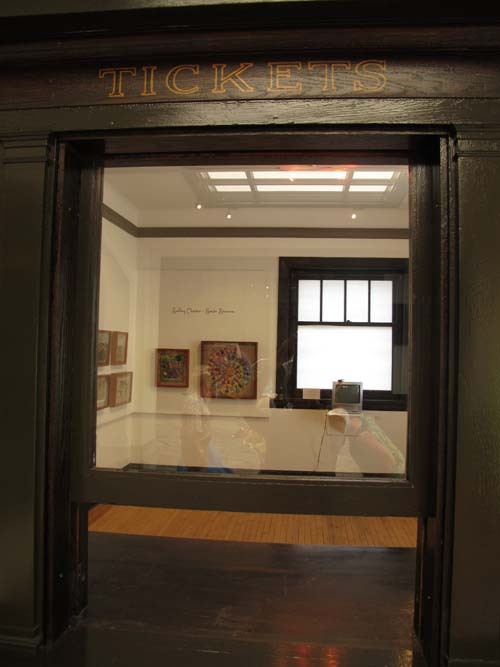 My work is in a cozy gallery in the former ticket office area. They’ve kept the dark wooden trim and ticket window in place. Inside, there’s a small TV where my Rabbitat film is shown. 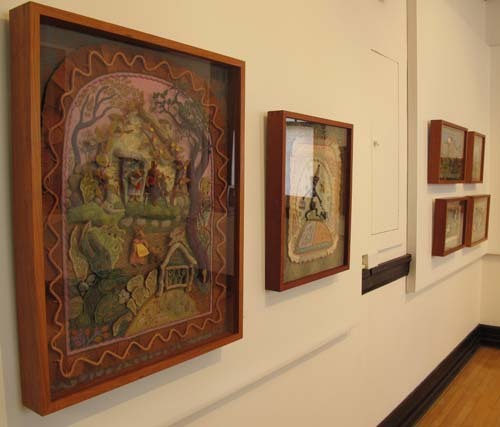 The original Rabbitat is on display, along with a variety of illustrations and other fabric relief pieces that I’ve made over the past 15 years. There are several original illustrations from Pocketful of Posies, too. Self Portrait: A Personal History of Fashion and The Storyteller and George’s Chair are included in the show. 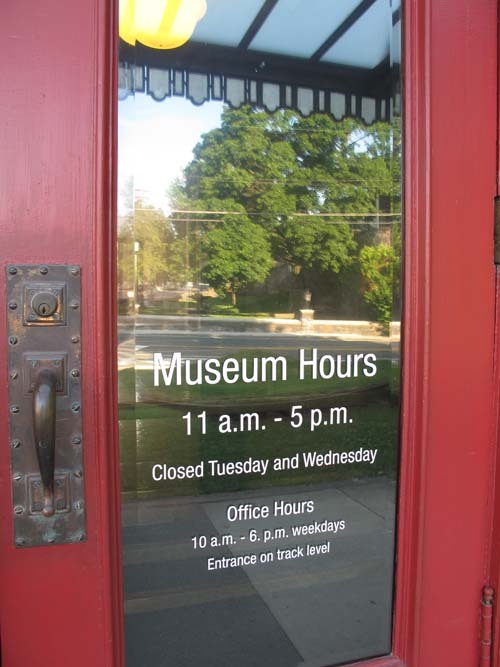 All of the galleries in the museum were packed at the opening and I saw several people whom I’ve met through e-mail. 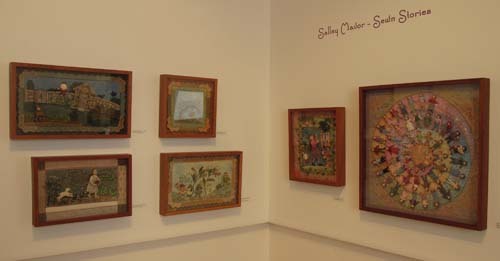 The curator, Susan Calabria did a fantastic job preparing for and hanging the exhibit, which will be visited by groups of children over the next 6 months. 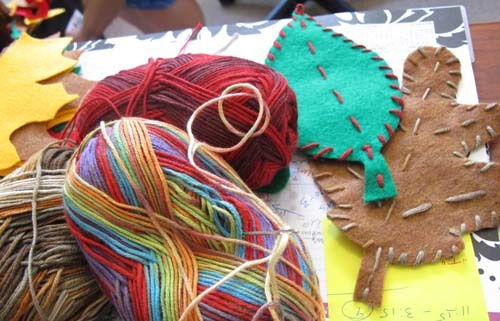 She came up with a simple, sweet, stitched felt leaf project for all ages. I hope that some of you will find your way to southern Vermont to see the show! 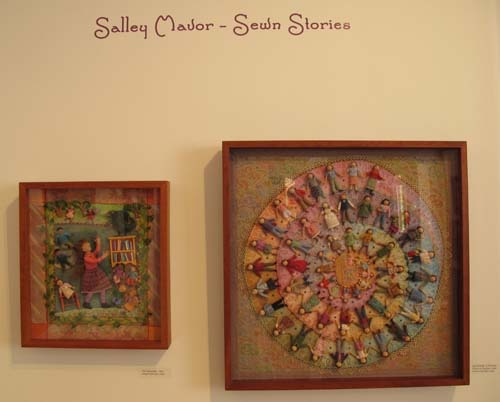 This entry was posted in Children's Books, Embroidery, Fabric Relief, illustration, Posies Traveling Show, Rabbitat, Travel by Salley Mavor. Bookmark the permalink. I hope you get up to Vermont, Liz. FYI, there will be an exhibit of illustrations from Pocketful of Posies at the Dodd Center at UConn in Storrs from Oct. 10 – Dec. 16, 2011.
it looks wonderful. wish i could see it in person. je suis admirative, quel travail.. I took my children down last week and we LOVED it. It was so great to see your incredible stitching up close, a completely different experience to your books. My daughter’s favorite was your life in fashion and my son loved the halloween picture. Me – well -I loved them all! Carolyn, I’m so glad that you brought your children to see the show! Thanks for the report. Oh, I just found your blog thru the SCBWi conference blog. I LOVE YOUR WORK!! Have had the Wee Folks book for years, and make little people with my students almost every year. (I am an art teacher) and also an illustrator. LOVE, LOVE, LOVE your beautiful embroidery! !